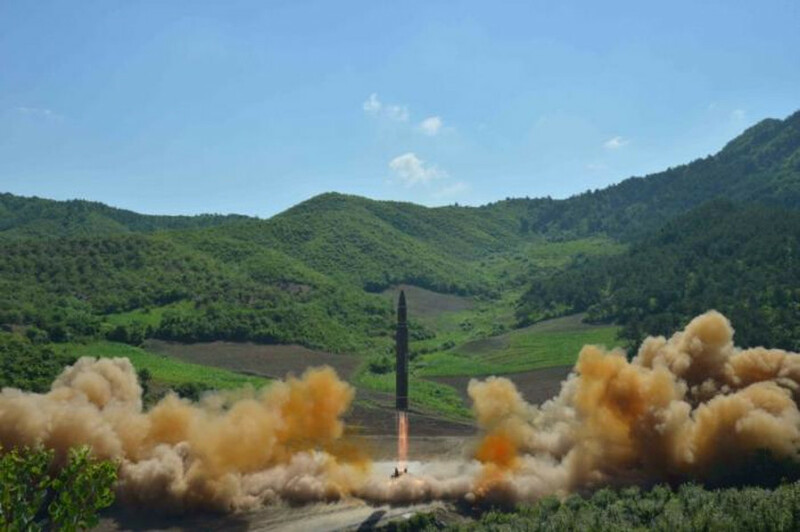 Home » Headlines » World » North Korea tests its first missile able to strike the U.S.
North Korea launched the Hwasong-14, its first intercontinental ballistic missile (ICBM) able to hit any point in Alaska. Weapon specialists believe that it can travel more than 4,970 miles after studying its 39-minute flight. They launched the missile at the end of U.S. Independence Day, just days before the Group of 20 meets to discuss future actions against Kim Jong-Un’s regime. North Korea’s supreme leader supervised the launch, which flew 580 miles across and reached an altitude of over 1,741 miles. It was “far more successful than expected,” according to American missile experts who assured that it’d be at least a year until North Korea developed an ICBM able to reach the continental U.S.
North Korea is ready to attack the U.S.
After completing its flight, the missile landed in Japan’s Exclusive Economic Zone (EEZ) on the Sea of Japan. It did not hit any vessel or cause any damages. North Korean state TV called the event a “shining success,” leading U.S. intelligence to redesign its objectives for the upcoming G20 meeting. The Pentagon first noted that the Hwasong-14 was a “land-based, intermediate-range” missile after it landed in the EEZ; they later noticed that the weapon’s initial arc was too steep, which allowed it to reach an altitude of 1,741 miles. The International Space Station orbits at 248 miles above Earth. To classify as an intercontinental ballistic missile, it must have the potential to fly over 3,400 miles in a horizontal trajectory. “This is a big deal: It’s an ICBM, not a ‘kind of’ ICBM. And there’s no reason to think that this is going to be the maximum range,” stated Jeffrey Lewis, director of the East Asia program at the Center for Nonproliferation Studies, according to the Washington Post. It is not clear how the Trump administration will deal with North Korea’s new ballistic abilities. White House press secretary Sean Spicer claims that Trump is being intentionally vague about his way of responding to how he will take future actions. On the other hand, before assuming office, Trump assured he would not allow North Korea from developing an ICBM able to reach the United States, the same one tested on Monday.